Some pretty great things are happening at this website. First of all, it’s currently free. Free is good, so let’s all enjoy it while we can. Newsela lets you sign up for a teacher account and create a class. After that, you basically peruse a bunch of high-interest current events articles that are written with ‘student interest’ in mind. You can assign articles to your students based on your curriculum or just plain interest. 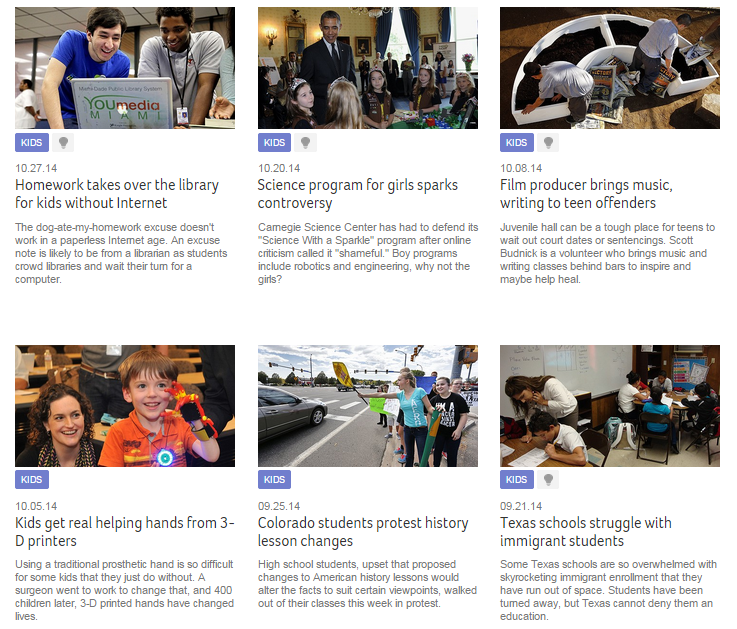 Here is a small sampling from just a section of one of Newsela’s pages of high-interest nonfiction current events. If there’s a little lightbulb next to the blue box, it has an accompanying quiz! Another noteworthy feature of Newsela is that many of the articles have accompanying 4-question quizzes that truly do match the Common Core standards. And, if you’re looking for a specific grade level, topic, or reading standard, their search bar is really quite helpful. My son is a sophomore in Advanced Language Arts, and his teacher is using Newsela this year to expose the students to online nonfiction passages. The teacher has decided to assign 6 specific articles (which have accompanying quizzes), and give students the freedom to choose 4 of their own (also with quizzes). Because they are in honors classes, she expects all students to read at the top two lexile levels. She has each student enrolled in her Newsela classes, and from her dashboard she can view the number of quizzes taken, lexile level at which they were read, and the overall quiz average. This marking period, she has chosen to give a quiz grade to each student for their overall quiz score on the 10 Newsela quizzes. I sat down with my son last weekend as he took a few of those quizzes, and let me assure you that the depth of the question increases with the lexile level….some of those questions REALLY required higher-level thinking! So, my primary school teacher friends, what does this mean for us? Well, it’s only for our older students at this point. Lexile levels for the articles presented begin at a 4th grade level. For that very reason, I will advocate for teachers who have students reading at levels of grade 4 and above to use Newsela because of the exposure to: a) nonfiction; b) online reading; c) online quizzes; and d) current events. Additionally, we all know that each year we have advanced or even gifted students that we struggle to challenge. This is a phenomenal tool to keep those kids engaged. In conclusion, I truly believe Newsela is a tool worth trying with your students as a quality reading tool. Whether you choose to print the stories, use them as whole-group lessons, assign them to students independently, or just use them as Social Studies supplements….it’s a valuable resource to share with your students! As always, I love to hear your feedback and reactions. Please share @kerszi on Twitter, comment at kerszi.wordpress.com on my blog, or follow and comment at My Primary Techspiration on Facebook.